In love your with your LG Chocolate phone, but wished it was a little bigger, and its MP3 player a little beefier? 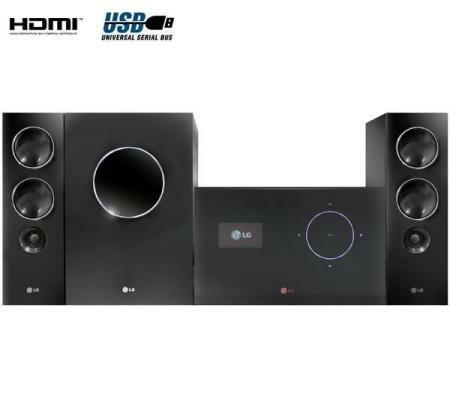 Then check out the LG J10HD Home Cinema, which adopts the same glorious style of LG’s famous designer phone, and adds a 150W sub-woofer, two 75W speakers, 80GB hard disk and DV player. Obviously it doesn’t let you make a phone call, but if it’s Chocolate style you want, the LG J10HD has it in spades. 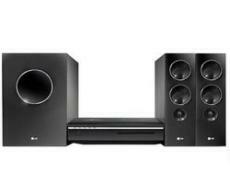 More details of the LG J10HD home cinema system after the jump. The first thing you notice about the LG J10HD is its looks. Just like the LG Chocolate phone, it’s minimalist in style and makes a change from the gaudy button-strewn systems that bedeck your local Curry’s shelves. It’s features aren’t half bad either. The hard drive lets you record up to 30 minutes of digital radio, or rip CDs and store them for later playback. There’s a USB slot for playing or uploading content from USB sticks or MP3 players, and a HDMI port to connect to your HDTV (there’s also a SCART and component video socket for connecting to older TVs). The DVD player supports DVD-R/RW, DVD+R/RW, DivX, WMA, and VCD/SVCD formats, and there’s a time shift function for playing back live radio broadcasts. Annoyingly, there’s no easy way of getting your media onto it from your PC, as there’s no Ethernet or WiFi connectivity, so you’re stuck with either burning your tunes onto CD from your PC and then ripping them onto the hard drive, or transferring them via USB stick (which I guess is the 21st Century’s version of transferring tunes via cassette tape…which is just a bit lame!). That said, the LG J10HD is a glorious looking beast, and with over 300W RMS of power output, should be more than enough for your home cinema needs.